A few years ago, I visited Taste of London for the first time. I had a lot of good food on a gray and drizzly London afternoon, as you do. I distinctly remember a small dish from a restaurant named Zaika, which I had never been too, and the refined modern Indian taste of that little morsel somehow managed to ingrain itself into my head ever since. I have therefore been meaning to actually go and dine at Zaika for a long time now, and finally managed to do so last Friday after work. Mrs. LF had been there once before for a business dinner (i.e. she didn’t have to pick up the tab), and said that the food was excellent but that the service was pretty horrendous. So, duly prepared for what might be awaiting, I left work promptly, got delayed on the Circle Line (what else is new? ), and arrived uncharacteristically late by about 10 minutes. 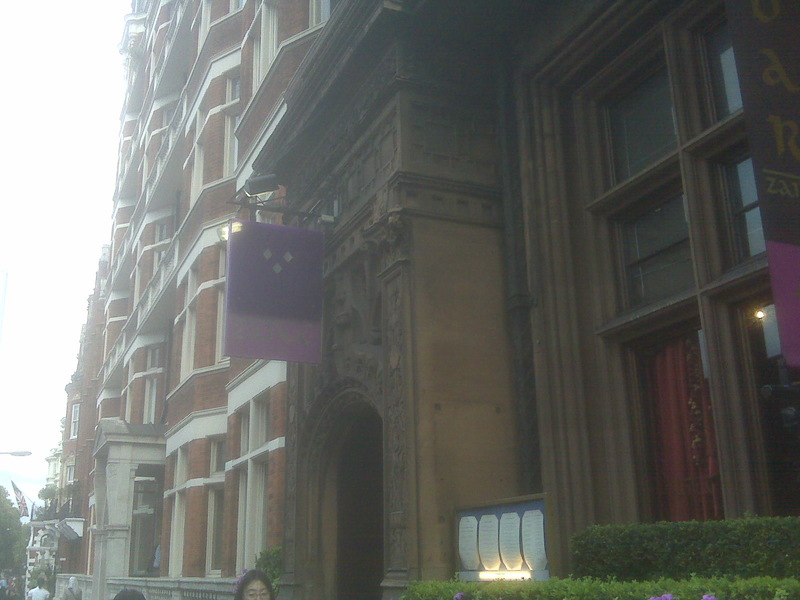 I tried to snap a picture of the facade, but my Blackberry camera just wasn’t up to it (see effort below). I stepped inside, eager to see what this place was all about and to hopefully end the working week on a high note. Can we have 5 minutes to actually read the menu, please? I was greeted by a very pleasant Eastern European woman whom I informed that my wife had already arrived, and she knew exactly which table I was after. As I was in a bit of a rush, I didn’t really take in much of the environs, except to notice that it was a very old and grand space, and that it seemed to be decorated tastefully for the most part. I learned later that the building was originally a monastery and later became a bank, before being converted into the present-day restaurant. I soon settled and had a chance to survey the restaurant. I noticed aside from the large and semi-casual open space there was also a very pleasant, medium-sized bar area – always useful – and overheard a waiter espousing the merits of the cocktails more than a few times to other customers, whom he eventually converted to his line of thinking. But I was there for the food, so after chatting with a French member of staff (who I suspect had been trying to chat up Mrs. LF prior to my arrival as they seemed rather cosy with each other :)), we got the menus and got down to business. The food at Zaika is under the direction of Sanjay Dwivedi, who originally hails from Delhi, but left at the age of 16 to pursue a life in London with his elder brother. He ended up putting in time at some very reputable establishments (including Le Caprice, The Ivy and The Lanesborough), and afterwards spent some time at restaurants in the Maldives and Los Angeles, and finally 6 months at Tabla in New York, which is a wonderful ‘new Indian cuisine’ restaurant that I used to enjoy visiting when I lived in that fair city. Zaika’s food mixes refined takes on Indian classics, along with some interesting flavor combinations which fuse Indian and Western tastes. It was a very ‘in’ restaurant when it first opened its doors, and soon thereafter had the honour of being the sole Indian restaurant in London to hold a coveted Michelin star. However, it hasn’t had its star for a while now, and I was very curious to see what would be arriving on my plate, and how it would be presented. There were 4 tasting menus by my memory, with the cheapest (and to me the most appetizing) being £39 for 6 courses, which is quite reasonable for dinner at a restaurant of this calibre in London. By the way, they are also doing a special ‘credit crunch’ lunch deal – £20 for 2 courses or £25 for 3 courses, including a glass of wine and coffee – which seems like good value. We, however, have been eating too many tasting menus as of late and wanted to give our stomachs and livers a rest, so we opted to go à la carte, even though we knew it would probably end up costing about the same as a tasting menu. After perusing the various menus and choices (and it’s quite a bit of reading material) for no less than a minute or so, we were suddenly interrupted by a rather tactless and charmless waiter, who actually appeared to be running the floor. “You ready to order?” I felt like telling him where to put all of his various menus, but regained my composure and restrained myself by replying curtly, “We just got the menus, could we have a few minutes to look at them?” He said nothing and scuttled off. We couldn’t help but thinking that this kind of service would be more at home at our local Indian takeaway, which might be doing a disservice to them. He finally did come back, and took our order. I tried to ask him a question about how a king prawn dish was served, and he didn’t quite seem to grasp what I was getting at. He was wholly un-engaging and completely disinterested in us all together – he was just there to get his order efficiently and rush it off to the kitchen. So we obliged. I cautiously asked him for a recommendation for a glass of wine, and he gave me two options – luckily, one of them was the one I had wanted to go for anyway, so I did, although I didn’t feel any more confident in my selection as he didn’t even bother to get the sommelier to come over (I hadn’t realized there was one at that point). So far, so shaky. I certainly didn’t feel very invited, but was still excited about the prospects of the food. My wine arrived quickly, already in its glass with no offer of seeing the bottle. It was a 2006 Grüner Veltliner Haidviertel Weinviertel Dac (Pfaffl, Austria), and it was good, refreshing and complex, as a proper Grüner should be. I was happy to be sipping on the perfectly chilled wine and my palate was now on high alert. Soon after the wine arrived, another waiter (a young Spanish guy this time) came with an amuse bouche, which he explained as best he could. We made out that it was a Chicken and Yogurt Soup with a Chicken Pakora served on top. It was served in a little white china cup with a matching lid, on top of which was placed the little pakora, which tasted the part and had been deep fried adequately well. The little cup of soup was a revelation, and I detected coconut sweetness which was balanced beautifully by the sour streak of the yogurt. We thoroughly enjoyed it, and were now eager to see what would follow. 8/10 for the soup. 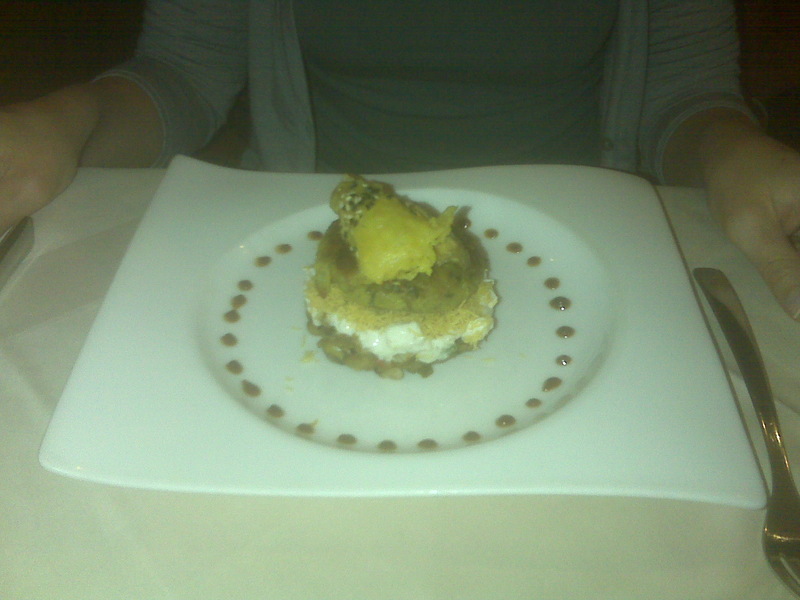 The starters arrived promptly after the teaser course had disappeared. Machli Chaat / Tuna Salad (£9): Seared yellow fin Tuna, crusted with mild spices, coriander & fennel seeds crushed jersey royals, green beans, coriander cress lime oil. My starter was fresh and fairly well executed. The tuna had been seared well, although the a few slices were a bit more well-done than they should have been. Overall the flavors worked well together and it was a nice dish, but nothing to write home about. 5.5/10. Aloo Chaat / Potato chaat (£7.50): Yukon ‘gold’ & globe artichoke ‘tikki’, black eye beans laced with tamarind chutney, sweetened yogurt & ‘garam’ flour vermicelli, topped with artichoke fritter. Mrs. LF’s chaat was much tastier, and was very well done. It was quite sizeable for a starter (actually, mine was too), and this refined version of classic Indian street food fit the bill. The best part about aloo chaat is the combination between the sweetness of the chutney, the creaminess of the yogurt and the starchiness of the potatoes. Although it was good, both of us agreed it didn’t hold a candle up to the Bombay Chat at La Portes des Indes, which comes in bite-sized portions and has much richer and distinct flavors. Still, it was a quite acceptable and very satisfying dish. 7/10. The main courses were brought very soon after our starters were cleared, which unfortunately was in-keeping with the lead waiter’s ethos thus far. Sarsonwala Titar / Tandoori guinea-fowl (£18.50). Tandoori breast of guinea fowl marinated in mustard and aromatic curry leaves, fired in the tandoor, ‘masala upma’ polenta, Asian greens, summer truffle shavings, chilli consommé. 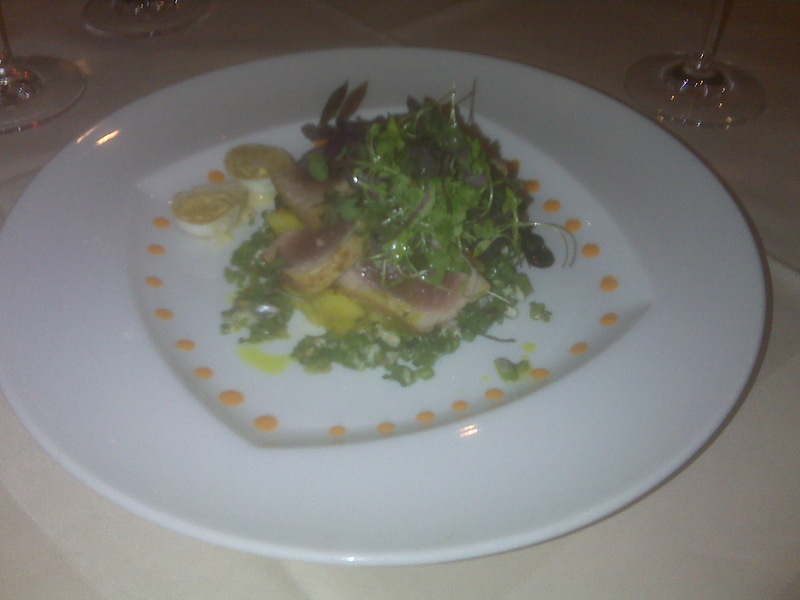 My main course was wicked and I thoroughly enjoyed it. Part of the guinea fowl had been baked in the tandoor, while other half appeared to have been cooked via more traditional methods (probably in pan). I was relieved to find the tandoori part of the bird to be extremely moist and infused with the flavors of the mustard marinade, as so often meat cooked in the tandoor can become dry, rubbery and flavorless. The consommé was excellent and definitely packed some heat (the right amount for me), the green beans added a good bit of crunch, and the summer truffles really accentuated the polenta base – giving the dish that extra element which made it truly memorable. 8/10. Again, it was a large portion, but that’s a good thing when you’re dining à la carte, right? Speaking of large portions, we noticed that the couple sitting next to us had gone for the tasting menu, and the portions seemed very large compared to most of the tasting menus I’ve seen – which I guess is a good thing if you’ve starved yourself…but we were glad we stuck with the main menu on this occasion as we just weren’t up for that large and diverse an intake of food. The couple did seem to enjoy each course and talked about the food a lot, which is always nice to see. So often in expensive and/or fancy London restaurants, I find that people don’t seem to pay the slightest attention to the food – which always grates on me. By the way, I had ordered a new glass of wine to go with the main course. I kind of wanted to stay with the Grüner but in the spirit of exploration, I spoke to the sommelier to get a recommendation (the French waiter finally called him to our table after my questions took him beyond his comfort level). After going around in circles for a few minutes, I decided to stick with my original inclination, a 2007 Laborum (Torrontés) from Cafayate, Argentina. It was a good companion to the guinea fowl dish but I found it to be slightly too alcoholic and it was rather dull when sipped on its own. Possibly it had been served too cold, as after it sat for a while, it did develop slight honey notes, but the finish was pretty absent. Tikhi Jhangli Machli / Spicy Cod (£16.50). Pan fried ginger and chilli marinated Scottish cod, crushed summer peas tempered with mustard seeds and mint, green cabbage and asparagus flavoured with fennel seeds. My wife’s cod dish earned some serious accolades from a woman who by her own admission is “not the biggest fan of fish.” The cod was cooked perfectly: it was delicately soft, flaked just how it should, and was very fresh (she said it didn’t taste at all ‘fishy’). The sauce was excellent too, lending a welcome bit of spice, and the peas had been skinned, giving them an extra soft texture which worked well with the fish. She was very impressed by this dish and gave it 8/10. PS – sorry there are no photos of the main courses; we started eating them before we remembered take pictures, and it looked to messy by that point! By the time we had finished our mains, we were pretty stuffed, so the palate cleanser generously offered by the kitchen was much appreciated. 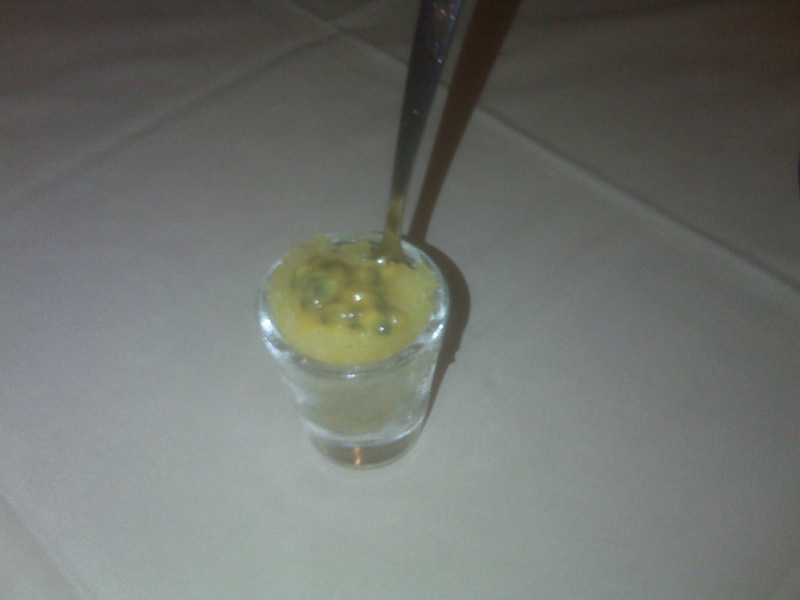 It was a passionfruit granita, with some passionfruit seeds placed on top. It was fresh and tangy, and did what it was meant to…get us in the mood for dessert! Against our better judgement, we opted for the largest possible dessert on the menu – but it was okay, we were going to ‘share’ (amazing what you tell yourself to have what you shouldn’t!). Zaika Gourmet Platter for 2 (£12.00). 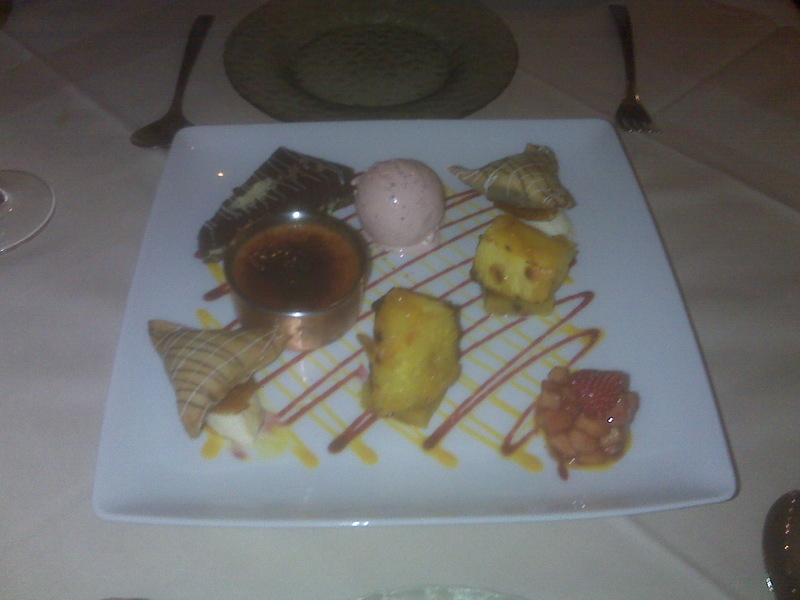 Chocolate silk, chocolate samosa, rose kulfi, tandoori saffron pineapple, rosewater & vanilla crème brûlée. All of the desserts, with the possible exception of the ‘chocolate silk’, delivered elements of traditional Indian desserts (a nice touch), and it was a well thought-out assortment of flavors and textures. The tandoori pineapple was very good on its own but the thin, soft biscuit underneath wasn’t really to our taste (I think it had almond paste and cardamom in it). The rose ice cream (kulfi) was excellent and the crème brûlée was very crisp on top and rich and creamy inside – with the right dose of rosewater. I personally liked the chocolate samosa and, although the chocolate filling was a tad too dry, the hot banana underneath was always going to be a winning combination (Mrs. LF wasn’t so keen on this one for some reason). The ‘chocolate silk’ was in danger of being too weak and samey as it was basically a thick and chilled chocolate mousse on top, but the base layer created enough and interest and contrast of textures as it contained many chunks of fruits and nuts. 7/10. Zaika has a lot going for it. The dining space is grand, open and well designed. The food generally lived up to my memory of that first dish I tasted years ago at Taste of London. It was consistently well executed and each dish had a little individual flair to it, which elevated it to something that you couldn’t order from your local curry-in-a-hurry. The flavors were well conceived and combined, and made for a very refined and original take on Indian food with its subtle Western influences. Unfortunately, you don’t get treated very consistently or very well as a diner at Zaika. We had a completely random assortment of staff serving us, both in terms of nationalities (we counted French, Spanish, Italian, Eastern European and Indian) and attitudes. This isn’t necessarily a problem in and of itself, but the real fault lies with the fact that no one seems to be properly trained and there is no consistent way of doing things. While some of the staff were very nice and chatty, they didn’t come across as being professional, and the head waiter bordered on being rude most of the time; he was just there to execute orders and serve them as quickly as possible. This is based on our experience over the course of the evening, and also the missus’ previous dinner there about a year and a half ago – when she made identical remarks. This is most certainly the main reason Zaika has lost its Michelin star, and I don’t think it would take too much effort to remedy the situation. I really hope that someone tries to take control of the front of house and make sure that their guests receive a warm and professional service, because if they can do that right, they might start attracting in some more regular diners aside from the tourists and business suit / expense crowd that seem to make up a large proportion of their current customer base. The food and the building itself certainly deserve more than that. This entry was posted in Finer Fare, Laissez Eats and tagged Indian Food, Laissez Eats, London, Sanjay Dwivedi by laissezfare. Bookmark the permalink. Quite a variable evening in terms of food, service etc.